All star game last ride for flag football great. was like any other afternoon for senior Boulder City dual-threat quarterback Jeanne Carmell, who concluded her prep career with a 18-12 high school all-star game victory for the Sunrise at Clark high school, with a clutch performance in the closing minutes. 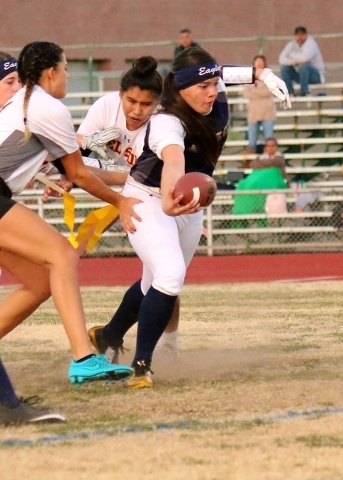 With the game knotted at 12-apiece, the two-time state champion and Sunrise player of the year would give the valley one last memorable performance, hitting a streaking Moapa Valley wide reciever Alexis Schraft down the left sideline for a 60-yard, catch-and-run touchdown to lift the Sunrise all-stars. “It was certainly an awesome experience to see our girls close out their careers with a victory,” Boulder City head coach Chris Morelli said. Churning another spectacular performance, Carmell, who Morelli has called the best flag football player he’s ever coached, finished the night nine-of-19 for 154 yards and a touchdown, while rushing for 59 yards on eight carries with a score. One of the all-time greats to play the game, Carmell concluded her senior season with 5,321 passing yards and 66 touchdowns, versus just three interceptions, while rushing for 1,539 yards and 23 scores. For her career, Carmell finishes with 12,190 passing yards, 145 touchdowns and only 14 interceptions, while running for 4,698 yards and 56 touchdowns. Also participating last Tuesday, senior receivers Oshanna Remy and Tarah Cox both recorded a reception, along with the junior tandem of Kenadee Bailey and Aimee Finn. Remy would go on to haul in a 17-yard reception, while Cox would record a 12-yard reception for the Sunrise. Recording 12-yard receptions as well would be both Bailey and Finn. Remy, led all Division I-A receivers this past season in receptions and receiving yards with 106 and 1,484 yards apiece, along with 15 touchdowns, while Bailey led the Division I-A ranks in touchdown receptions with 17. Bailey would also garner 940 yards this past season on 63 catches. Also representing the Sunrise for the Lady Eagles last week were senior defenders Emma Jeppsen and Makenzy Waldo.